Donated saplings from the Bartlett Tree company. 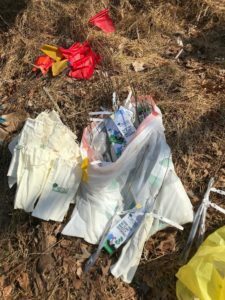 To get an early jump on Earth Week and Arbor Day, student volunteers from the RU Outdoors Club and Ecology department came out to plant trees in the RU EcoPreserve. Bare root sapling “whips” of flowering dogwood, black gum and persimmon were planted in several gaps opened up by Superstorm Sandy back in 2012. Since then the gaps have been invaded by a thick ground cover of stiltgrass and mutliflora rose. 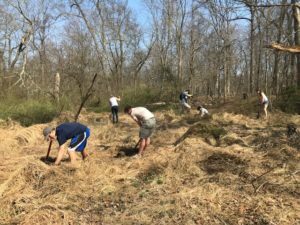 The students removed some of the competing vegetation and planted the saplings with the hope that these native species of trees will eventually grow and shade out the invasives. While once comparatively common in the Preserve, flowering dogwoods have taken a real hit in storms over the past several years. The black gum and persimmon will add greater diversity to the Preserve’s forest. The saplings were generously donated by the Bartlett Tree Company.